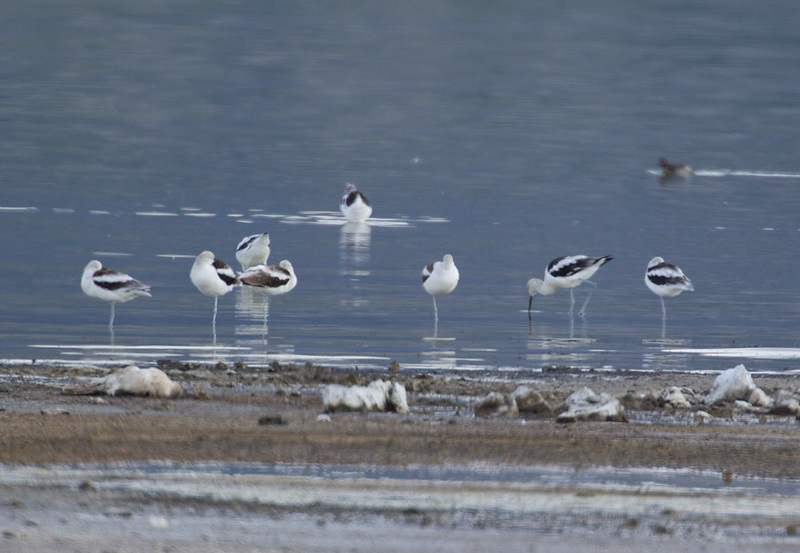 I’ve heard so much about birding at Mono Lake the last few years that I was really excited about our trip there. In fact, we probably spent more time at Mono Lake than any other single place during our trip. We stopped on the west side on our way in, where we got my favorite shots, ones I posted on an earlier post. The only birds I saw there, though, were California Gulls. We went to the north end of the lake the next morning, but the birds were a long way out and the sun was directly behind them, making them little more than silhouettes. In fact, even with a 500mm lens about the only birds I could positively identify were the large Osprey on the left and the large Great Blue Heron on the right. A birder told us that the north end of the lake was beautiful at sunset, so we decided to come back just before sunset. We did manage to get some better pictures, but we were still a long ways away and these shots didn’t seem that special when compared to the ones I got at Bear River earlier in the summer. 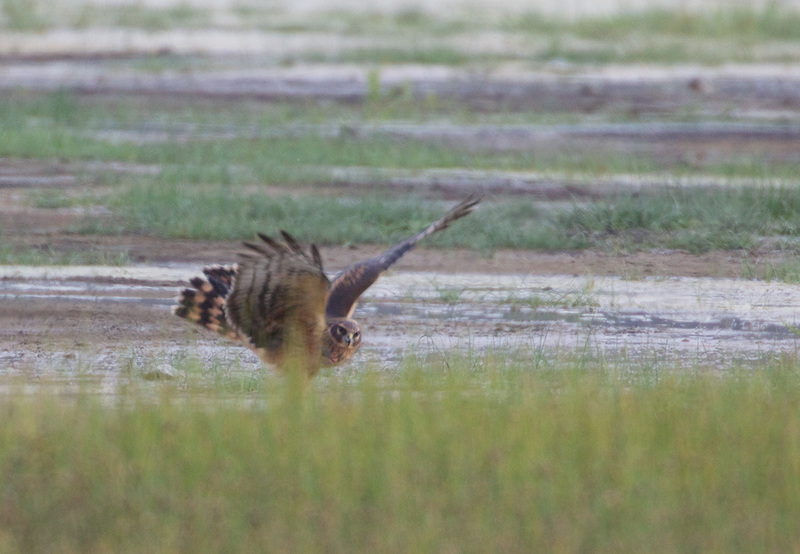 Leslie did manage to get a nice shot of a Northern Harrier while I was trying to get shots with the 1000 mm lens. 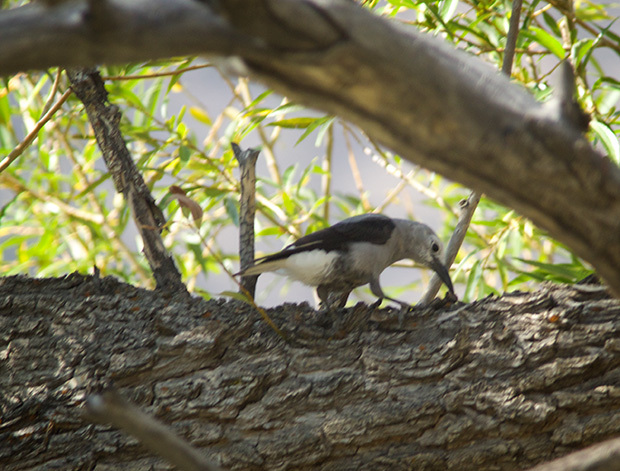 However, the only shot I probably won’t delete is this shot of a Clark’s Nutcracker, not the first time I’ve seen them, but the first time I’ve ever managed to get a shot of one, a rather blurry, dark shot at that. Strangely enough, a Clark’s Nutcracker landed right in front of me later in the trip, but I was carrying a 17-55mm lens and it was gone long before I could get back with a birding lens; otherwise I could delete ALL of the bird pictures I managed to get at Mono Lake. Mono Lake lies in a lifeless, treeless, hideous desert, eight thousand feet above the level of the sea, and is guarded by mountains two thousand feet higher, whose summits are always clothed in clouds. This solemn, silent, sail-less sea–this lonely tenant of the loneliest spot on earth –is little graced with the picturesque. It is an unpretending expanse of grayish water, about a hundred miles in circumference, with two islands in its centre, mere upheavals of rent and scorched and blistered lava, snowed over with gray banks and drifts of pumice-stone and ashes, the winding sheet of the dead volcano, whose vast crater the lake has seized upon and occupied. However, I would concede it’s probably not going to become one of my “Go-To” places, and not just because it is farther away than most of my “Go-To” places.